Early Saturday morning there were those out in the snow who were working serving others. The Shoreline Fire Department was making an emergency call at 20th Ave NW and Richmond Beach Road. Just minutes later mailman Steve Kinsman, aka Frosty, was making a delivery on 20th Ave NW. Steve has been working this route for years. If you are near the mailbox when he comes past he will always greet you with a big smile and a friendly comment. In a couple of months Steve will have been a postal employee for forty years. He is really an outstanding individual. 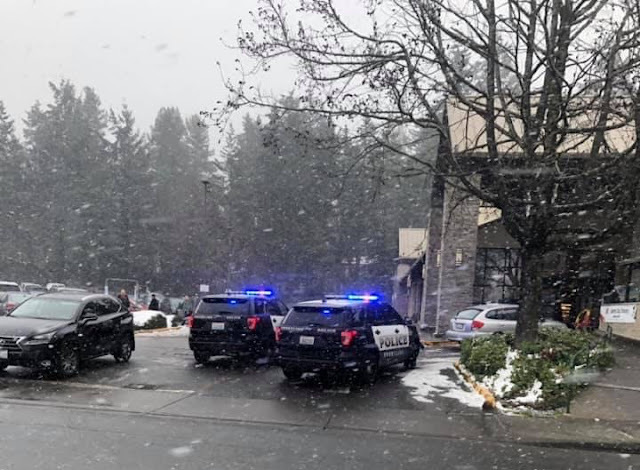 And Friday, the Shoreline Police were on the job, responding to a bank robbery at the US Bank inside the North City Safeway. They brought in a tracking K9 but were unable to locate the robber. It was all over so quickly that most shoppers did not even realize there was a problem. Thanks to all the folks out there that have the job to be out in inclement weather. wondering about the motto sleet, storm nor dark of night. Our cul de sac has not had mail in 4 of the 6 days last week....they say they can't reach us?? ?